I was recently sent a Tommee Tippee Closer to Nature Digital Video Monitor with Movement Sensor Pad to try out. I have to admit I'm a bit of a technophobe and I found it a bit daunting to work out how to use it! I got my OH to read the instructions and set it up and then explain it to me! I've found that as I'm getting older I'm easily flummoxed by things (ugh, old age setting in!). I was keen to see how good it was as it won an innovation award in 2011. The other main feature about this monitor is the sensor pad that is designed to sit under baby's cot mattress and will trigger an alarm if no movement is detected for 20 seconds, with adjustable sensitivity settings. So what do we make of it then? What struck me first was how sleek and design conscious both units were. They are black and white and really streamlined. We've always had an audio monitor up till now for both Isla and Noah, so we've found that we really like having a video monitor! It's good to see Noah (I like seeing him with his cuddly Bobby the Dog, wrestling around when getting off to sleep!) and when he makes any noises we can see what he's actually doing. The picture quality is excellent, especially with the night vision camera. The sound is crystal clear as promised, not that we wouldn't be able to hear the little darling as he is rather loud when he's belting out for his late feed! We've always been used to our monitor showing us the temperature in the bedroom and so I was glad that this was also a feature of the Tommee Tippee monitor. It always helps us to know what tog sleeping bag to put him in before bed. We used the movement sensor pad a few times but decided after a while that we didn't need it. The pad is designed to detect baby's movement and if none is detected for 20 seconds then an alarm will go off. The alarm is designed to alert the parents but it is also to shock the baby into moving. Personally I think that this is a great feature for first time parents who may be a bit nervous and need that extra peace of mind. We're not those kind of parents though. Noah is our second baby and we're not as nervy about him as we were with Isla. The video picture for us was enough to check on him. We also had a couple of occasions where the alarm went off and it was purely because he had been a wriggle bum moved around sideways in the cot and was completely off the pad! This is quite common for him as he is 7 months old and moving about loads, but for a newborn and maybe up to 6 months then I would say the pad would be great. One thing that I would like to see if the monitor was revised in the future would be for the parent unit to be charged using a docking station, for ease of use really. 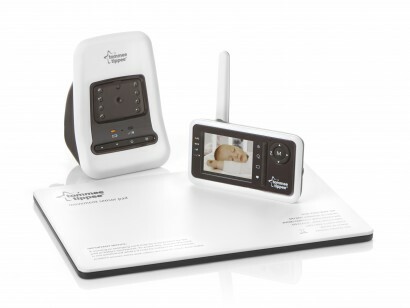 All in all I would recommend this product, it is a little pricey, but you do get what you pay for and the audio, video and movement pad all combine to give excellent reassurance to parents while their babies are sleeping. This baby monitor was sent to me to review. My review is honest and the words are my own. We also use this product and loved it at the start. My son turns one tomorrow so we have used this product everynight for a year. Lately the video screen has been blinking and finally the screen has gone totally black when using nighttime mode.